(Photo: Kent Smith / Fox International Studios). WARNING: Outcast season two spoilers. While Cinemax has not yet announced the US season two premiere date for its Outcast TV show, in UK, the second season premieres on FOX, Monday, April 3, 2017, at 10:00pm. 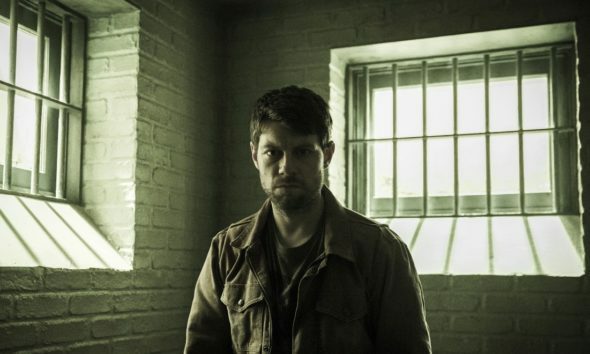 The British broadcaster has released episode descriptions for Outcast, season two. Check them out, below. A horror drama based on the Skybound/Image comic by Robert Kirkman and Paul Azaceta, Outcast stars Patrick Fugit as Kyle Barnes. The Cinemax TV series cast also includes Philip Glenister, Wrenn Schmidt, David Denman, Reg E. Cathey, Kate Lyn Sheil, Madaleine McGraw, and Brent Spiner. Joining the series in the second season are Briana Venskus, C. Thomas Howell, Chris Green, M.C. Gainey, Madelyn Deutch, Hoon Lee, and Gabriel Bateman. Outcast follows Kyle Barnes (Fugit), a young man who has been plagued by demonic possession all his life. Now, with the help of the Reverend Anderson (Glenister), a preacher with personal demons of his own, Kyle embarks on a journey to find answers and regain the normal life he lost. But what Kyle discovers could change his fate — and the fate of the world — forever. Season 2: In the second season of Outcast, the exploration and mystery of what lies behind the supernatural manifestations and why they are drawn to Kyle Barnes continues. As the possessions that have plagued him grow in scope and number, Kyle struggles to protect those he holds most dear. At his side are Reverend Anderson and Chief Giles, while his sister Megan grapples with her own demons. But otherworldly threats prove greater than Kyle could ever have anticipated. His struggle will grow into a fight for all of Rome, as he discovers the haunting secrets of his own past. 201: Kyle finds the possession phenomenon to be more widespread than he had imagined. Reverend Anderson struggles with guilt over his actions at the end of Season 1. Megan and Holly deal with the aftermath of Mark’s tragic death. 202: With the help of Chief Giles, Kyle pursues a more aggressive strategy to deal with the possession problem in Rome – and discovers a new foe. Reverend Anderson faces the consequences of his rash choices. Megan resorts to desperate measures to deal with her grief over her husband. 203: Megan must face the consequences of her actions in Ep. 202. Meanwhile, a disappearance in Rome leads Kyle and Anderson to a new and dangerous consequence of the rise in possessions. 204: A dangerous fugitive on the loose threatens the town of Rome, as well as Reverend Anderson’s sanity. Kyle struggles with a new understanding of where his powers – and his curse – originated. Megan and Holly attempt to rebuild their lives. 205: Kyle gets closer to finding Sidney, while Anderson discovers an unexpected potential ally. A prominent member of the Rome community is revealed to be an agent of the possessed, and few characters will escape his plan unscathed. 206: Kyle’s family and friends mourn the aftermath of 205’s disaster – until a revelation from Reverend Anderson compels them to use Amber’s unique powers. Allison rejoins her family in Rome. 207: Kyle attempts to get his family to safety as the town of Rome becomes increasingly overrun by the possessed. Anderson takes Megan under his wing, bringing her to find solace in an unlikely place. Chief Giles realizes his wife has been resorting to desperate measures. 208: Kyle faces the mysteries behind his powers. Reverend Anderson finally confronts Sidney as Doctor Park’s plans grow in scale. Megan makes an unlikely friend – one who will prove dangerous. Chief Giles tries to defend himself and his wife from the tide of the possessed in Rome. 209: Kyle and Anderson face down Sidney – until an unexpected threat intervenes. Megan leaves the relative safety of the backwoods church, and danger quickly finds her. Tragedy strikes the Giles family. An unexpected stranger rivets Kyle’s attention. 210 (Season Finale): Kyle reluctantly joins forces with a mysterious stranger in an attempt to end the possession threat once and for all, but fears the man may be hiding something. Megan struggles to escape her captors. Reverend Anderson shares an unexpected source of strength with his old friend, Chief Giles. What do you think? Did you watch the first season of the Outcast TV series? Do you plan to check out season two on Cinemax? Tell us. Just air season 2 already…the start date online is April 2017….hello it is August….WAITING PATIENTLY!!! This show is the reason im keeping my subscriotion!!!! Quarry was good and it’s gone…Banshee gone. Starz is outdoing you with Outlander and American Gods. Agreed…I’m keeping my subscription judt to warch this. I think that you are reading the season one start date for Outcast. At least, when I have looked on Skinimax’s website, it said June 3, 2016. Season 1 was almost good but kinda slow , hope to see it faster in season 2.